Peer-to-peer fundraising empowers your supporters to raise hundreds or even thousands of dollars for your cause, even if they can’t personally make a large donation. Turning supporters into fundraisers also allows organizations to reach a much wider audience than might ordinarily be possible. As with any instance of teamwork and delegation, however, it can be scary to share your responsibilities and goals. You will probably have some power fundraisers, but not everyone will know what to do or how to be successful for your cause. Unfortunately, you can’t monitor and personally guide every fundraiser through the process. At least not one-on-one. But with the help of automated email and drip campaigns, you can offer help and support to keep fundraisers active and motivated. In this blog, we’ll take a look at some of the ways you can use email to bolster peer-to-peer campaigns and we’ll finish with some ideas to pump up your fundraisers. How did you learn how to fundraise? It probably took a lot of research, experience and a ton of trial and error. If you want your fundraisers to be successful, at the very least you need to provide them with some basic advice on how to reach out and get donations. Don’t bog readers down with the entire history and ethos of the organization in the email, though. Tell fundraisers what they need to know to present the cause to others and suggestions on how to start asking for support. Scheduling emails to be sent at a certain point in your campaign is a pretty simple process. You can use a CMS or CRM to do this, or you can use an app like Boomerang or Streak for Gmail. It’s a good idea to schedule a series of emails to be sent to fundraisers, maybe one at the beginning for onboarding, one in the middle to breathe new life, and one toward the end for the final push. On a more advanced level, you can send emails in response to a fundraiser’s specific activities. In other words, you will trigger an email as a response to what’s happening on the fundraiser’s page. This kind of communication works a lot like a drip campaign. For example, in a drip campaign if a contact clicks through one email, they’ll receive another one based on that interaction. So if someone makes a fundraising page, you can set your CRM or CMS to trigger a thank you email that encourages them to reach out to close friends and family. By automatically responding to a fundraiser’s activity (or inactivity), you can give them the positive reinforcement or motivation that they need at that point in their fundraising experience. Here are a few cool examples of ways you can use automated emails in response to a fundraiser’s actions. 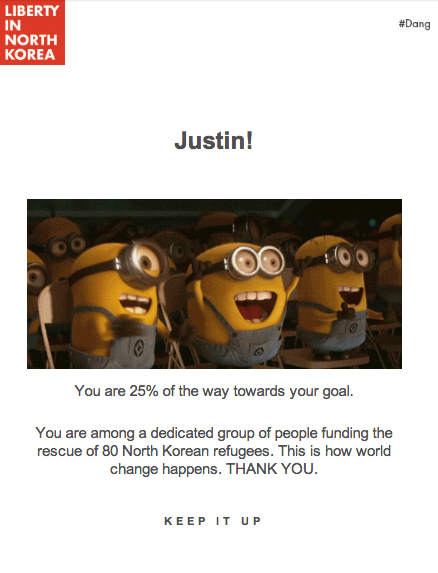 One way to use automated email is to congratulate and thank fundraisers when they succeed. For example, Liberty in North Korea sent this email when a fundraiser had raised 25% of their goal. You can do the same for someone who raises 50% or reaches their goal. By making sure fundraisers get recognized as soon as they succeed, you show your appreciation. 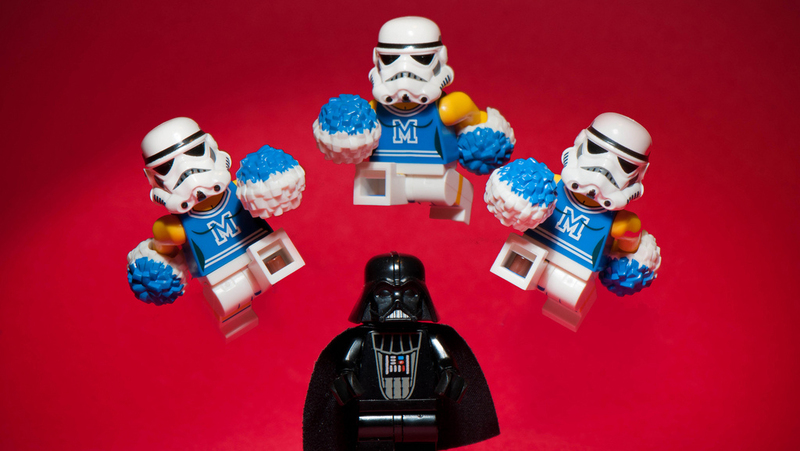 And positive reinforcement can keep people motivated over the course of a campaign. When I visit my LinkedIn page, there is a little graphic in the side bar that tells me if I haven’t posted in a while. This reminder is usually enough to get me to post again. Sometimes, just pointing out a lack of progress is enough to motivate someone. Emails are a way to reengage with those people who create a fundraising page and then … crickets. If a fundraiser has been inactive for 5 days (or however long) you can remind them to reach out to their friends and family. You can even send some extra tips to guide them through the process. Although you’re trying to get fundraisers to take action, remember to keep the message positive. You can simple thank them for making a page and offer a little help. You can unite the efficiency of automated emails with the power of storytelling by letting fundraisers “unlock” a story, piece by piece. Let’s say that when someone makes a fundraising page, you send a video introducing the main character in your story and the problem they face. But they have to fundraise to find out how it ends. You could send another video when they are halfway to their goal and give the conclusion when they meet it. If someone makes a fundraising page, they have already shown interest in your cause, so show off your best impact story to keep them hooked. Try to end each chapter with a cliffhanger so fundraisers are motivate to find out what happens next. Your campaign videos probably won’t become an HBO series, but adding a compelling story can create a personal connection and interest that keeps fundraisers focused. Even though your fundraisers are taking the initiative to promote your cause, they still need a little guidance. By preparing with automated emails and onboarding tips, you can make your network of fundraisers even more powerful. Not only do these emails help supporters fundraise more effectively, they also acknowledge their hard work and commitment. Staying involved in their campaign shows that you care about their success.